Last weekend I started up the main trail and followed it for the most part. I had to turn just after the cables on Sunday morning, as did another party. The snow on the switchbacks was powdery and slippery and that part of the trail was exposed. Up to that point we had gotten by with decent waterproof footwear and hiking poles. Just today I read a trip report describing in some detail how people went up the chute to the West of the switchbacks as late as June 2010. With snowshoes and more prior experience [than none] in self arrest we might have gotten a look at Trail Crest. Up to the Whitney Zone border, the snow was either absent or below ankle deep. Beyond that point, we began to follow the tracks that went before us. These breeze past the sharp turn to the right onto the switchbacks down to Bighorn park and descend a steep slope near Outpost camp. There was lots of activity at the Portal when we passed through on Saturday. I'm also thinking of making an ascent, probably solo. I've never done Whitney in the winter and wouldn't do solo except the snow is so minimal this year. I have the gear, have done rainier and some other climbs. Would appreciate people's input on conditions this March/April. "In spite of warnings by descending climbers that the route was not passable above Trail Crest our team reached the top of the highest mountain (14,505feet) in the contiguous United States and the first and only team which reached the summit after the last storms till that weekend." It appears to be a SF Bay Area meetup group. About 15 people started out, maybe a third made the summit. A couple of shots after dark on the summit, though they didn't take gear to camp on the summit. Must have been a very long day. They base-camped at Outpost camp. Thank you for the link, Steve. Conditions don't seem bad. Interesting group. I admire thier determination, but wouldn't want to descend in the dark! Eric J climbed the Mountaineers Route on St Patricks day. I am going to head up to the eastern sierra next week thur-tue to do some car camping and hiking. I am thinking about an overnight to Whitney up the main trail and going up the chute to trail crest. I would bring micro spikes, crampons and ice axe. Anyone know if there is enough snow to climb the chute, and if i should bring snow shoes as well? Is the portal road open and can i drive up? Don't take snow shoes. You will find enough of a boot track that they won't be necessary. If you go, please bring back pictures. I'll help you post them. As for the chute, there probably is enough. It is enough of a north-facing slope that it will have a cover of snow. Please post trail conditions. I'm planning to go up April 12th if their is enough snow to go up the chute. 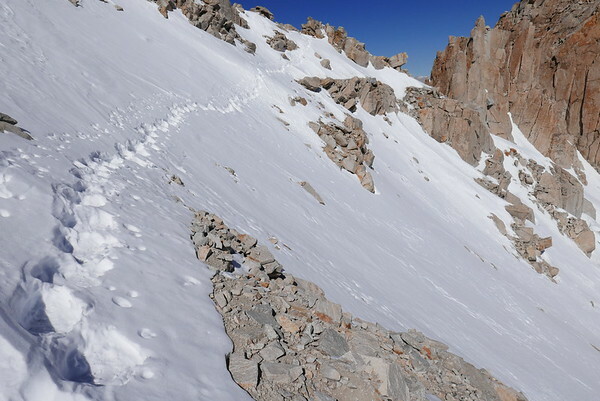 I am heading up Whitney (and hopefully Russell) via the mountaineers route this Friday (4/3)- Sunday (4/5). I'll be sure to take some good pictures and upload them here for everyone's viewing pleasure. Seeing them WILL be a pleasure! Best of luck on your adventure. Have fun, and especially, be safe. Currently there is enough snow in the chute. Its important to summit early as the snow melt so fast in the afternoon that all you do is postholing much. I was in Whitney Mar 28 for a day hike. Has anyone tried to go up the main trail yet? Would like to get up before the end of the month and before the trail quota kicks in. Dayhiked the main trail on Saturday April 5th. Snow started around 11,300'. I decided to take the switchbacks up and the chute down. The switchbacks are passable, but are a pain, the chute is much nicer. The snow was firm and had a nice punchy crust. Three people decided to glissade and all three came away with injuries (separated shoulder, cartwheeling and smashing into rocks. The chute is double black diamond glissading, don't try it unless you really have some experience, it was too icy on Saturday to even think about). For those who don't know: Glissading is done by sitting on the snow, and sliding, feet-first down-slope, trying to use an ice axe as a brake. It is really dangerous, sometimes fatal, when conditions are icy. Hiked up North Fork and established base camp at Upper Boyscout Lake. Trail was free of snow for the most part up until the boulder field after Lower Boyscout Lake. Snow had pretty firm boot tracks ascending the boulder field. Crampons not necessary. Upper Boyscout lake did have snow on the ground. Lake was still frozen over. Summit day. Snow was present for most of the way between Upper Boyscout Lake and Iceberg Lake. Once again, boot tracks followed much of the way and were firm enough to not use crampons. Iceberg Lake was frozen and the area around was all snow. Chute up to the notch was hard-packed snow. No post-holing. 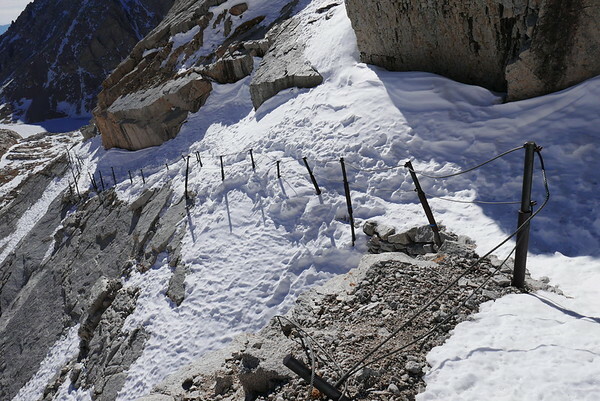 There were a couple of guided groups ascending the chute with rope, but crampons and ice axe worked just fine. The last 400 ft was covered with snow as well. Tracks have done a good job compacting the snow. Descending was a bit scary without a rope. I would recommend roping up if you are not comfortable on steep snow angles with big exposure. All in all, route was very manageable. Manage your time, and Summit early. Be safe. Going up is always easier than coming down. Any ideas what the conditions might be like early June? I have a permit but am debating on whether to fly out there if there will likely be a lot of snow on the mountain. I'm not to thrilled about a lot of exposure on snow/ice. Any advice? In a year with average snow-fall the MWMT usually remains covered beneath significant drifts of snow until mid-late June. However, we are in a record drought year, so we shouldn't have too much snow early June. I'm not anticipating anything significant A few friends and I are planning on climbing Whitney on the 6th. I'm not expecting anything more than a few drifts (worst case scenario you may want trekking poles and/or micro-spikes for a few sections). i live on the east coast and we have had lots of snow this year. Wasn't sure what it was like out west. Thanks for the feedback. I'm going for it! I agree with snackingbear. Last year I went up the first weekend in June and aside from a bit of snow on one part of the switchbacks the route was totally fine. This year we have had even less snow, I have a permit for May 29th and don't expect there to be any issues. I did the Mountaineer's Route the 1st weekend of June in 2014. There was some snow, but nothing we couldn't handle in micro spikes. We had crampons, but never had to use them. Last year was a dry year and this winter was even more dry. I'll post pics if I can get it to work. Generated in 0.193 seconds in which 0.181 seconds were spent on a total of 15 queries. Zlib compression disabled.